It can be a tricky business telling an artist why you like their new work, especially if the word "commercial" pops up, but Alex Kapranos seems remarkably pleased when it's put to him that while the new Franz Ferdinand album may sound completely different to anything they - and he - have done before, it's still capable of mixing it in the charts alongside the Taylor Swifts and Justin Timberlakes of this world. "I'm really happy to hear that," the wiry Glaswegian says. "All the music I've loved that's had an avant-garde heart to it has been pop, too. You'd listen to something like Laurie Anderson's 'O Superman' and think how strange it was, yet it had something about it that didn't feel wildly out of place in the charts and was heard by a lot of people." 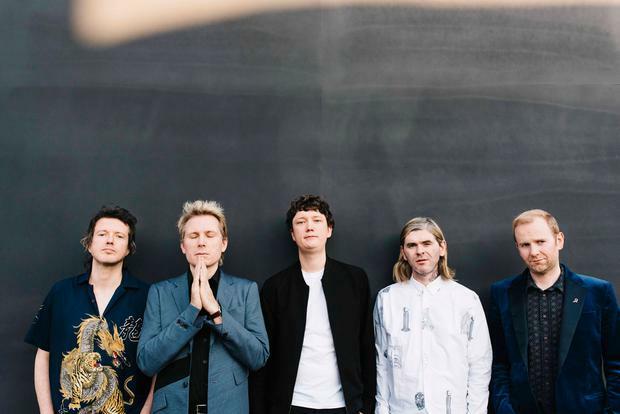 Alexander Paul Kapranos Huntley - to give Franz Ferdinand's frontman his full name - is talking about his band's latest album, their fifth, but anyone perhaps expecting to hear a song as gloriously deranged as 'O Superman' will be in for disappointment. Instead, Always Ascending is as smart and kooky as we've come to expect from this hyper-literate band, but where post-punk guitars helped shape their songs before, this one leans heavily on electronica and dance. It weighs in at the 40-minute mark and it sounds like the work of a band that had a lot of fun making it. "I hope when people put the needle on this record they know it's a Franz Ferdinand record straight away," Kapranos says. "I love what we did in the past and I loved making those albums, and it's not as if I want to make this a separate band, but I'd like people to think, 'That's Franz Ferdinand, but they're doing something completely different on this record'. "Our last record [Right Thoughts, Right Words, Right Actions, released in 2013] was at the end of a decade - it was literally 10 years of the band's existence. Then we did the FFS record [a collaboration with the long-running cult-pop outfit Sparks], the line-up changed slightly, and by the time we came to making this record, we knew it wasn't going to be the same as the band we formed in 2002." When he talks lightly of the line-up changing "slightly", he's referring to the departure of founding member Nick McCarthy in 2016. It was, apparently, an amicable split, inspired by McCarthy's desire to spend quality time with his young family. And when one considers that the band were on the road for 18 months after the last album and a further year of touring with the FFS album, one can perhaps see McCarthy's point. For this album, two newcomers have been welcomed to a fold comprising original members Bob Hardy, Paul Thomson and, of course, Kapranos himself. Julian Corrie (better known by his stage name Miaoux Miaoux) and Dino Bardot (once of Glaswegian indie outfit the 1900s) have helped radically change the band's sound, Kapranos says. But the new direction that Always Ascending takes the Franz Ferdinand fan on certainly bears the imprint of Philippe Zdar, the French electronica musician, famed for his own work with Cassius and for such production duties as Wolfgang Amadeus Phoenix from compatriots Phoenix. He also mixed Two Door Cinema Club's startling debut Tourist History. "I first spoke to Philippe about five years ago when he was working on the Beasties [Beastie Boys] record," Alex says. "We were making the last Franz record. And Laurence Bell from Domino had put us in touch, so I phoned him, just to say hi, and I ended up on the phone with him for over an hour. We just had this great connection. "I love his records, I love the sound of them, especially the Cassius stuff and I love the sound of the records he produced. Fast forward a couple of years and we'd been writing songs and we knew that the songs had taken a different form, a different sound and we were looking to go somewhere else on this one and as we were talking about producers, the first name that came up was Philippe's." Zdar was enthusiastic and spent a number of weeks living in Kapranos's home as the pair set about developing a sound that would push Franz Ferdinand's indie-pop leanings in a far greater electronic direction. Kapranos loves to talk about the finer points of music creation. "There's a great bit of hardware you can add to the Ableton software called Push that you can assign any scale or mode to and you find your fingers falling into patterns that they're not used to. "I guess that's at the heart of it - musically, it's coming up with ways to force yourself out of the patterns of recognition." Working with two new members freed up the creativity, too. "It didn't feel as strange as it might have done [not to have McCarthy in the studio anymore] because we had just made the FFS record - we'd collaborated with Ron and Russell Mael [of veteran band Sparks], we'd just come from a place where we were used to collaborating with people we had never worked with before and in a way that was a baptism of fire. In some ways, that was more daunting that starting this record." Kapranos has popped up on several albums and produced a Cribs album a decade ago. "I love collaborating with other people - it's very inspiring. You can see things from another perspective." And he's keen to employ other perspectives when working on the lyrics to his songs. He's long avoided the familiar trappings of love, loss and longing in his songs, favouring arcane subjects and unusual circumstances, and songs, at least partly, inspired by such post-modernists as James Joyce (see panel). "I love to create characters and try to see the world through their point of view," he notes, "but, of course, some songs are entirely based around my own experience, such as 'Lazy Boy' on this record which came to me when I was lazing in bed with my girlfriend." Much like Morrissey's recent single, 'Spent the Day in Bed', it's a song that celebrates the joys of doing absolutely nothing - an antidote to the always-on, information-addled times we live in. And the demand of these always-on times is, funnily enough, the subject of one of Always Ascending's most striking songs, 'The Academy Award', which looks at a world where we're no longer living in the moment, but rather immersed in our phones instead. "I was at a Kraftwerk 3D concert in London and this guy next to me was recording the whole thing on a tablet and you think, 'Why are you missing the entire thing? Really?'" It's an understandable complaint, especially as Kapranos is familiar with looking at Franz Ferdinand audiences, and seeing punters record their shows, too. But he's not one for grumbling. "I am," he says, "one of those lucky f***ers who gets to do the thing they love in their life."